At our online store you can browse through our catalog of products and information . You can add the products to your basket and change quantities or delete them . At the time of ordering, a page which requests your email address and password if you are already a customer of our shop, if not be an option to register your details still appear listed . Once completed your personal data, the choice of method of payment and shipping method option appears. Finally the order confirmation will be asked . Until you hit "OK" on the last screen, the order will not be processed. If you click "OK" , the order will be added to our list of orders and we will send you a confirmation email with the tracking code, by which you will know where your shipment is at all times. If your order has been lost or is taking too long, please call us at +34 625 364 103 or email to info@area51-rc.es to inform you of your order status . We have some products in our catalog that have not regularly in stock, but we can order them for you. Availability appears: "Product on request" The customer can buy this product even when its out of stock. Once payment is received Rotorhobby S.L. will order the product and as soon as we receive it, it will be send it immediately to the client. Clients who order products on request will be informed by us with a ss accurate as possible date of delivery, which will varydepending on the product and its origin. All shipments are carried by transport agency, using the company SEUR with 3 to 5 days delivery to the whole of Europe and within Spain & Portugal mainland we use MRW 24 hours delivery service, shipments to Canary / Balearic Islands, Ceuta and Melilla can take 48 to 72 hours. If the materials are available in our store the goods will be shipped the same day or the following day depending on the hour of ordering. In case of stock failure, we will contact you to notify the delivery date . Regarding the sending of special goods such as fuel are not allowed outside of Spain, within Spain we will use MRW for delivery within 24 hours , and to Islands and Ceuta and Melilla, use the blue package with a postal delivery 6-15 days . Orders will not be processed until payment confirmation. Upon receiving the package please check for signs of damage and claim it to the transport company within 24 hours from its receipt . We do not accept claims after that period. THis is the term we have been given by the transport company to claim any damage incurred during shipping . Payment can be made by (Paypal, bank wire transfer or Credit Card) . The prices listed in our catalog are total prices including 21% VAT. Prices apply to material in stock at the time of purchase. If the product is not in stock , Rotorhobby SL reserves the right to change the price at the time the product is available. We reserve the right to change prices or withdraw products from sale on our website at any time without notice. 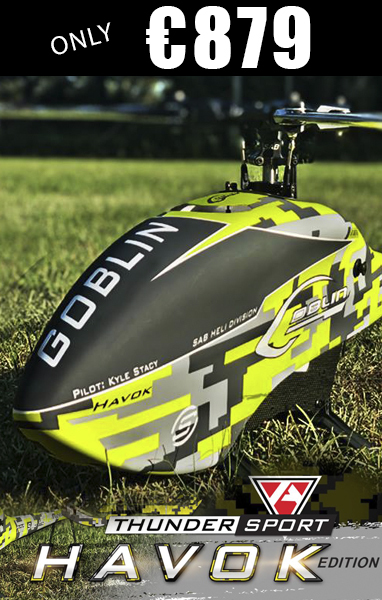 You agree when ordering that Rotorhobby can cancel or modify the order if there is a typographical or computer error within the description or price. If Rotorhobby S.L. can not supply the requested product for reasons beyond the company reserves the right to cancel the purchase and return the amount the buyer intregro . News , offers, discounts and other promotions are limited to stocks or conditions of each promotion, and may be canceled at any time. Upon receipt of the order, the customer must verify the good condition of packaging and package if it detects any anomalyshould be noted at time of receipt on the sheet before signing their agreement and make the photo / os related. If not, they give up any possible claim. Shall be communicated within 24 hours after Rotorhobby SL by email or by telephone, so that we canarrange or timely transport company claims. If the change is due to a mistake by Rotorhobby SL, we will send the goods ordered at no additional cost, and the customermust send the / the product / os properly packaged and postage due to the direction of Rotorhobby SL. The aim of Rotorhobby SL is always offering the best customer service. In case a product from our store has failed to work, please contact us so our technical service department can evaluate the reason and give a posible solution to the client. IMPORTANT: Do not attempt to repair any problems of this product, as this will invalidate the warranty. Rotorhobby S.L. obtained customer data for delivery of the products and process the payment thereof, and the periodicsending a newsletter, special offers, discounts and other promotions we may make to our store, if the customer has authorizedonline. All customer data will be incorporated into an automated file belonging to Rotorhobby SL which are not used or provided to third parties. You may request deletion or correction thereof by writing to Rotorhobby SL. At any time you can make changes to the customer account, accessing it using the username and password that was used to create it.